The Beautiful Butterflies Card Kit is available now! Quick, go grab your kit before it sells out! I have a feeling that this one is going to go fast! I have a couple of cards to share with you today. The first one is my personal favourite of the all the cards I created with this kit. 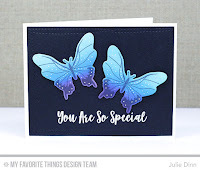 I stamped the butterfly outline on Smooth White card stock. I sponged on Distress Ink to create an ombre effect. I stamped the sentiment in Versamark ink and then embossed it with White Embossing Powder. 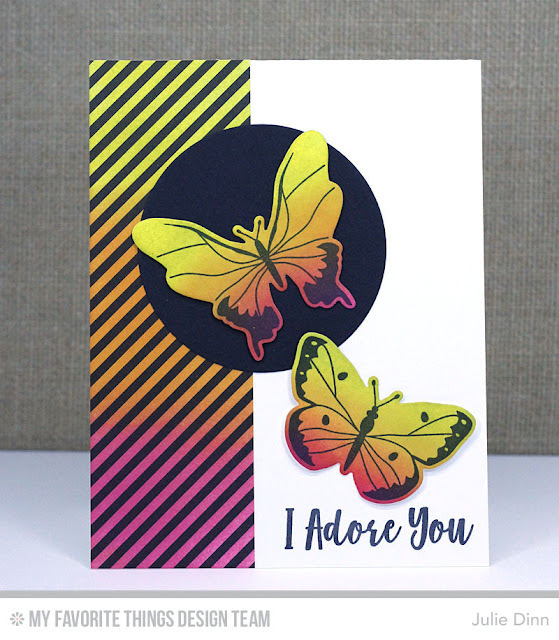 On this card I created the butterflies the same way I did on the previous card, I just used a different colour palette. I used the same trio of Distress Inks to ink up a piece of the Dots & Stripes Neutral pattern paper. Fabulous looking cards. The blending is beautiful and so are the choice of colors in both cards. Those butterflies are awesome! Love how you colored them.....distress inks = yum! Gorgeous cards I'll try. Thanks. Awesome cards!! You are a master at ink blending!! Just adorable in Happy and vibrant colors! Gorgeous butterfly cards! Love your beautiful color combos! Beautiful X 2!! Love your colors and designs! Beautiful cards! I love colors on both! I keep practicing my shading and blending skills...I'm not there yet. Your card is lovely! Beautiful butterflies. They really pop against the backgrounds. fantastic. They really pop off the card. Beautiful cards. Especially like the first one. Beautiful coloring. Gorgeous cards! Love the color combo on both!! Your cards are stunning--love the contrast! The colors you used in each of these cards are just gorgeous!! Beautiful cards with bold and beautiful colors! OMG!!!! I'm in love for your gorgeous cards!!! This kit is awesome!!! Both cards are beautiful but I especially love the second one with those gorgeous colours, the stripes, and that layout!! 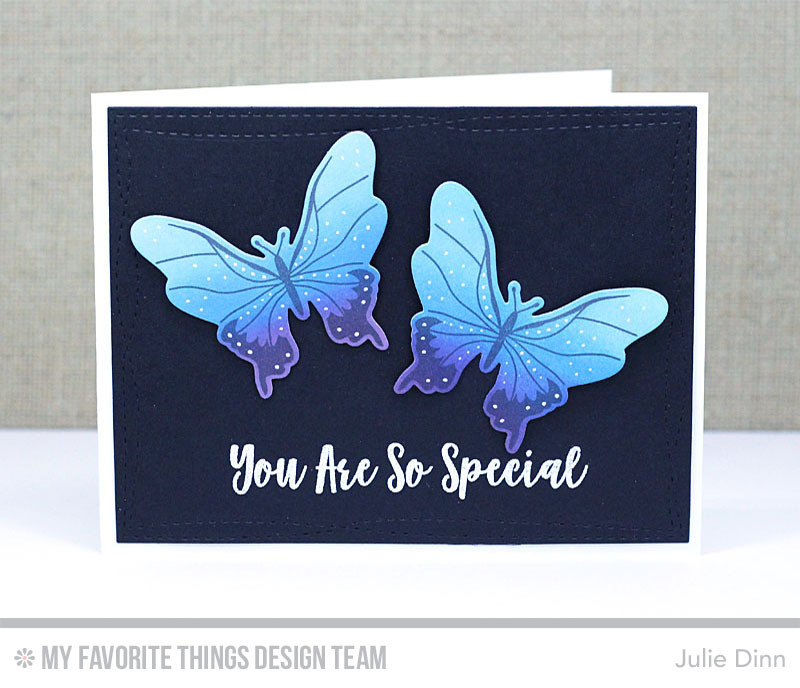 Wow placing these butterflies on black card stock really makes them pop. I really like the dark background- makes the card stunning. I love your color choice! Your first card looks like velvet ....... so gorgeous!! The second card color scheme just makes me happy. Love them both. I love the black background card. It is striking!